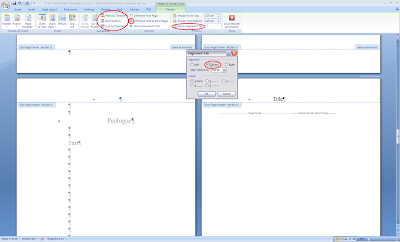 First up I am using Word 2007 so if you are using an earlier or later edition the location of the tool categories may differ. 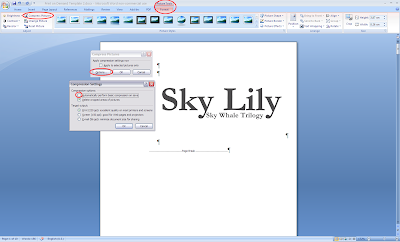 Now many people think that you need a specialised writing program to format book correctly, however with a little effort and know how you can prepare your book using Microsoft Word. 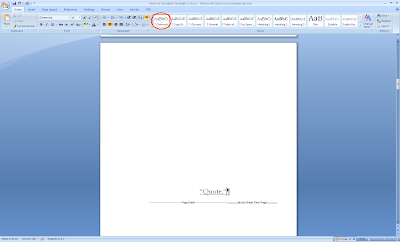 First things first open a fresh word document. First of all we want to check several things before we get started. So you want to want to click the main Word button and in the lower right hand corner of the drop menu select word options. 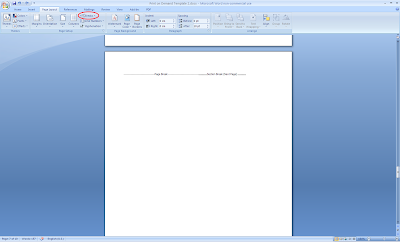 This will open a popup menu which holds commands for the whole word document. Here we need to check the proofing so click proofing along the left hand side of the menu. Here I only select, flag repeated words, check spelling as you type, use contextual spelling, and mark grammar errors as you type. Then you want to click on autocorrect options, which you will find in the top right hand corner. This will open another popup menu where you need to edit several things. 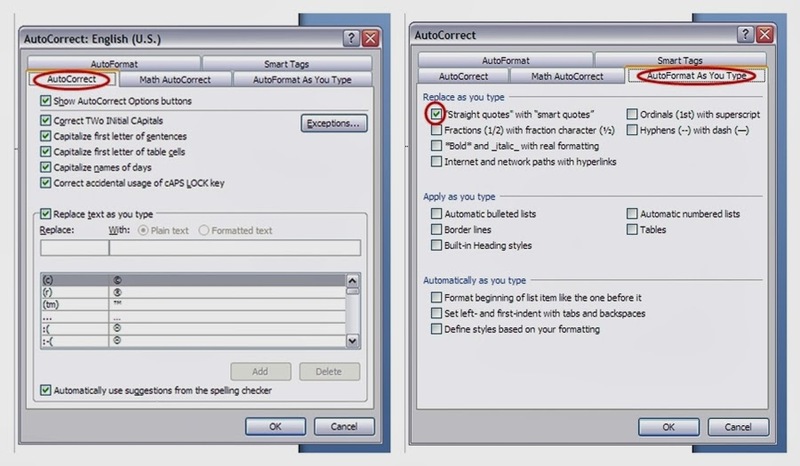 Under the autocorrect tab you can select all and under the autoformat tab and under replace you can select all and remember to select styles under preserve. 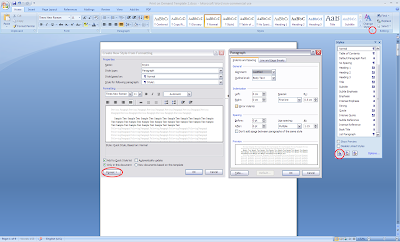 Here is where it gets a bit different under the autoformat as you type tab deselect all because this can cause problems when you upload your file, however I leave straight quotes with smart quotes selected as I prefer the look. 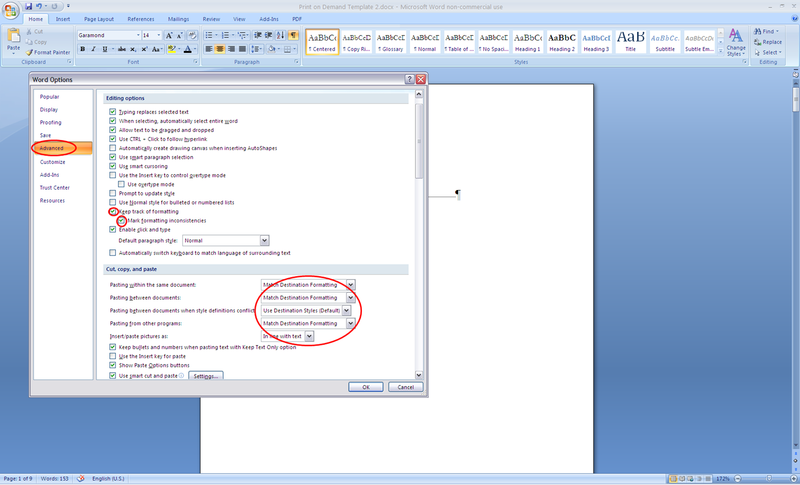 Next you want to go to click advanced on the left hand side of the word options menu. Here you want to make sure that under editing options, keep track of formatting is selected and mark formatting inconsistencies below it. Then in case you decide to copy and paste work into the document from another make sure under the cut, copy, and paste section you select match destination formatting for all. Now if you are like me and are using a lot of vocabulary from various languages fictional or not you may want to set up additional dictionaries to help the document cope with spell checking. 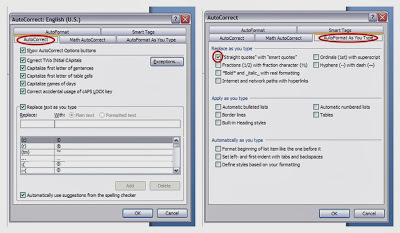 How you do this is head back to the proofing section and under when correcting spelling in Microsoft Office programs click on custom dictionaries. This will open a popup menu, here you simply need to click new on the right hand side then it will ask you to save the new dictionary so give it a name and click save. 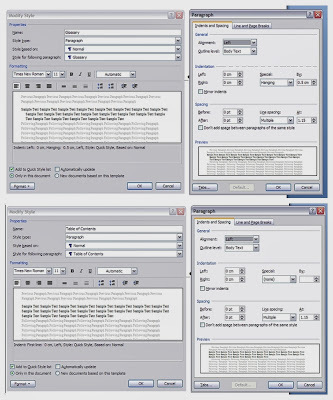 Next you want to fill it with words and you can do it one of two ways, you can select the dictionary and click edit word list, which will open a popup menu in which to enter the new words or if you select the dictionary of choice and click change default then all you need do is start a spell check and when a word is called up you simple click the add to dictionary button. After this we head over to the page layout tab and the page setup section, to open a popup menu click the small icon in the lower right hand corner of the section. 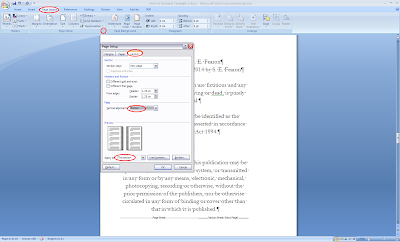 Now what you want to do now is head over to CreateSpace to choose a trim size because the size will determine how you should setup your document. Since I prefer small thick books I chose the trim size of 5 x 8 inches and according to their outline they recommend a margin of 0.5 inches and for the inside margin, also known as the gutter margin, they recommend 0.75 inches for a book between 151 to 400 pages. 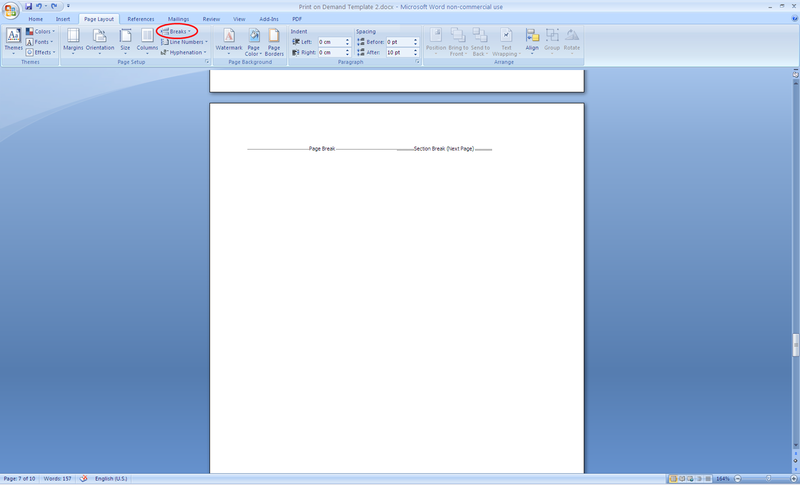 Note that you will have to convert everything into centimeters for Microsoft Word. With this information you are able to get started. So in the page setup popup menu you want to go to the margins tab and set all your margins to 1.27 cm and the gutter to 1.9 cm. 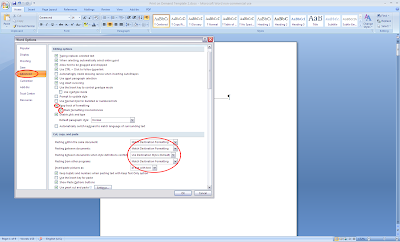 Then using the drop menu for multiple pages select mirror margins, and at the bottom of the page where it says apply to select whole document. Next click on the paper tab and select custom size from the drop menu and then you can enter the custom measurements, in this case 12.7 cm width and 20.32 cm height. 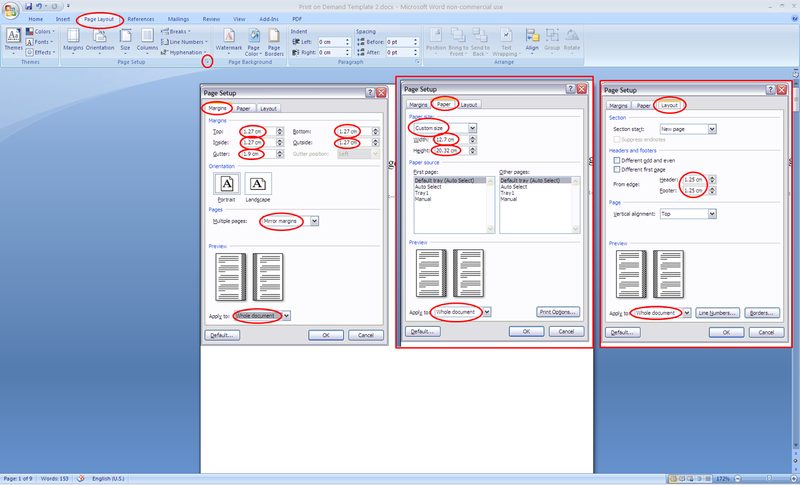 And finally click on the layout tab and make sure the header and footer are set to 1.25 cm. Now you will want to set some text styles as it is the easiest way to ensure that the formatting of your text will remain constant throughout your document. So head to the home tab and the styles section then right clicking on the style called Normal and in the drop menu select modify. Once you do this it will open a popup menu. In this menu you can edit the font style and size and its alignment. Now I typically use Times New Roman for the main text as most books use this font because it is neat, easy to read and it looks professional. A good font size is also 11 pts. Now that is done go to the lower left hand corner and click format and in the drop menu select paragraph. Here under the indents and spacing tab make sure that alignment is set to justified and that the indentation is set to 0 cm for the right and left and under special select first line and give it an indent of 0.5 cm. 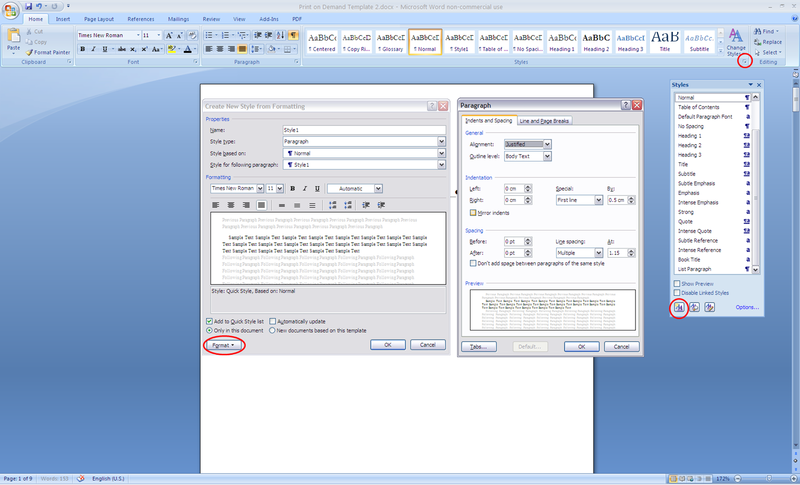 Then under spacing make sure that before and after is set to 0 pts and select multiple in line spacing and set it at 1.15. Now your Normal text is formatted. Next up is your headings style. So select the style called Heading 1, for headings it is good to choose a new font, personally I like Garamond as it blends well with Times New Roman but looks a bit more formal, a good size to set your headings at is 14 pts, and centered alignment of course. Now you want to go into paragraph again and set it the same as your Normal style with the exception of removing the first line indent. You may also want to set another heading style using Heading 2 and this time selecting bold, giving your chapter headings the following look. 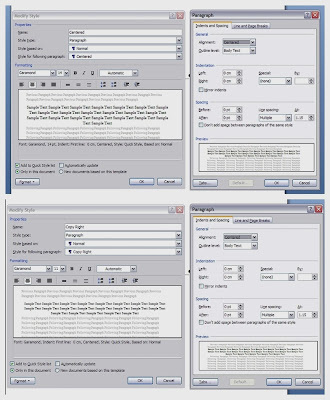 If you are like me two or three text styles may not be enough so you might want to create your own. To do this you need to click the lower right hand icon under the styles section this will open a popup menu. Here you click the lower left hand icon which has the yellow star and A in it. 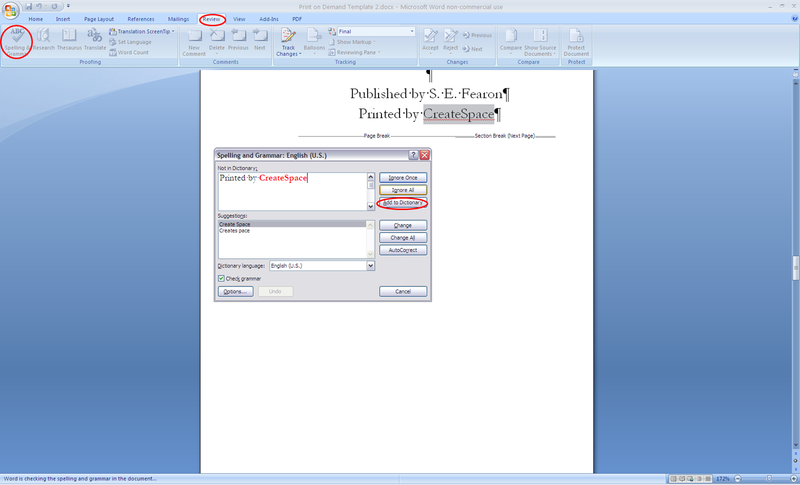 This will open another popup where you are free to name your new format and format it as you see fit. As examples I will show you some of my custom styles. Centered I use for the Title Page and for the Other Titles Page. Glossary, Copyright, and Table of Contents are pretty much self explanatory. Now it’s best to start your writing by setting the first few pages how you want them because doing so later can cause all sorts of issues. So we will begin with the first page which people will see when they open your book. It’s recommended that to start you have a page featuring the text used in the title so this will typically be an image. So head to the insert tab and click on picture you then need to locate your picture and insert it, once done you want to click on the picture tools format tab and under the adjust section click on compress pictures. A popup will appear and you want to click the options button, another menu will open and you want to deselect automatically perform basic compression on save. 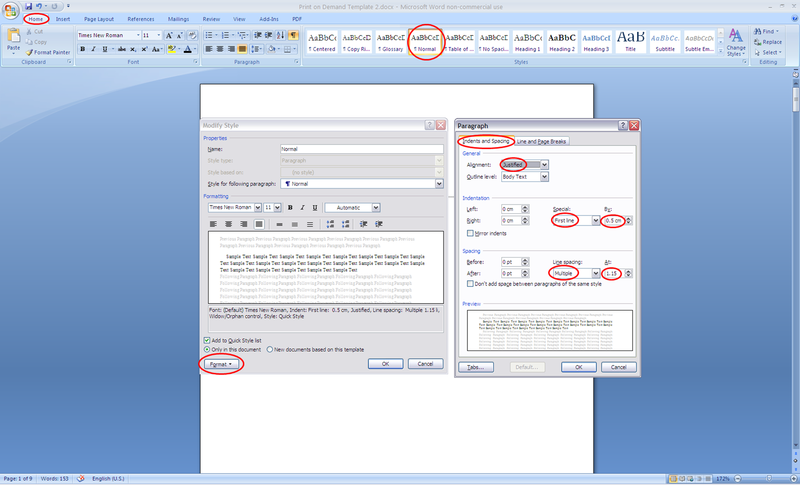 This will stop Word from altering the DPI of your image, for optimal printing you need a DPI of at least 300. 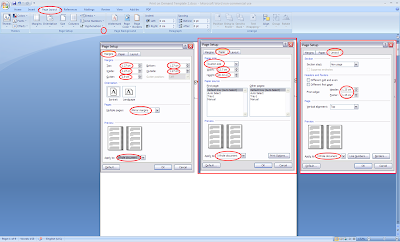 After this you want to go to the page layout tab and under page setup click on breaks and under page breaks select page and then repeat but this time add in a section break, so under breaks find section breaks and click on next page. 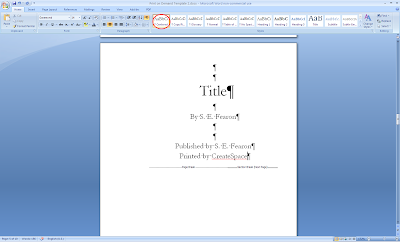 What you will end up with is a blank page between your title and your dedication page. Now you don’t necessarily need a dedication page but you'll want the blank page none the less. I feature a quote from the book rather than a dedication and when I do I set the page slightly different than the one previous. 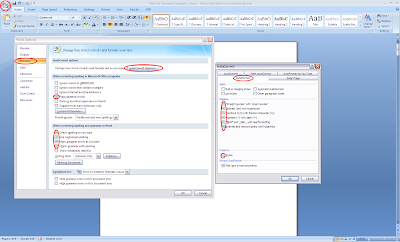 Head to the page layout tab and open the page setup popup menu then under the layout tab and under page select center from the drop menu, and very importantly at the bottom switch make sure apply to is set to this section. And like before follow it with a page and section break. This section uses the Centered style. 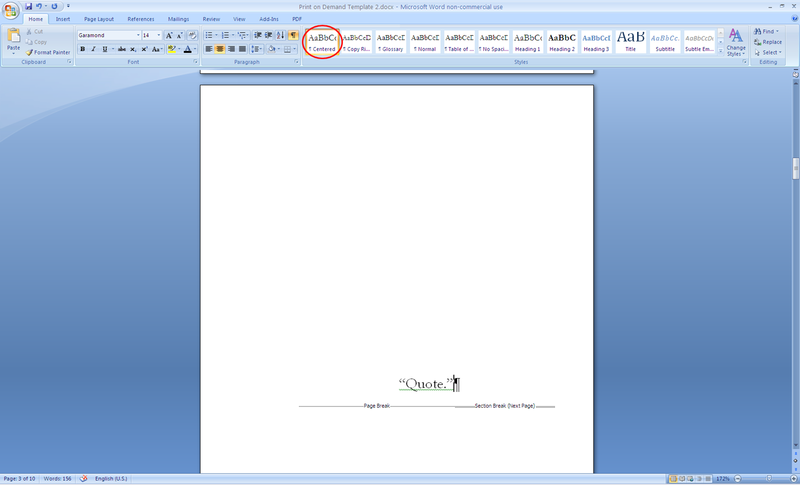 Then you will want to add another blank page via a page break before you get to your second title page. At this stage you may be wondering why all the blank pages, well you must remember that the first page appears on the right hand side of the book and so the blank pages make sure subsequent title pages begin as the first on the right hand side, all you need to do is to go to your bookshelf and check through a book to see this in action. 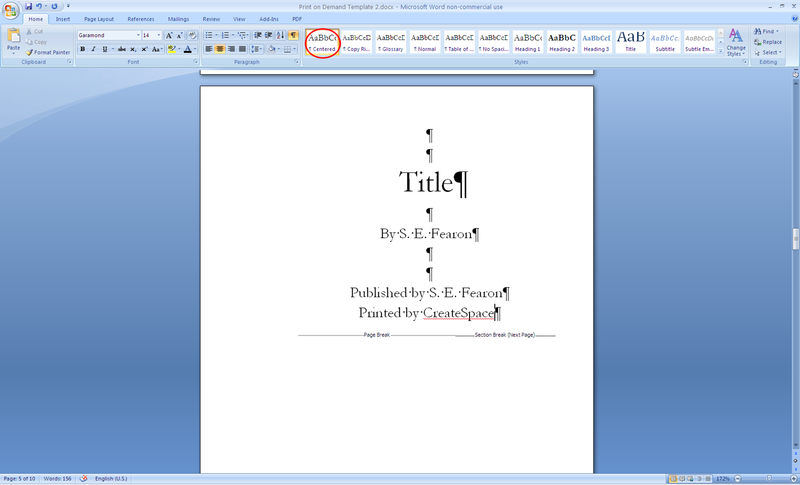 Anyway on your second title page you will simply type the title, the authors name, the publishers name, and that it is printed by CreateSpace. Follow with a page and section break. 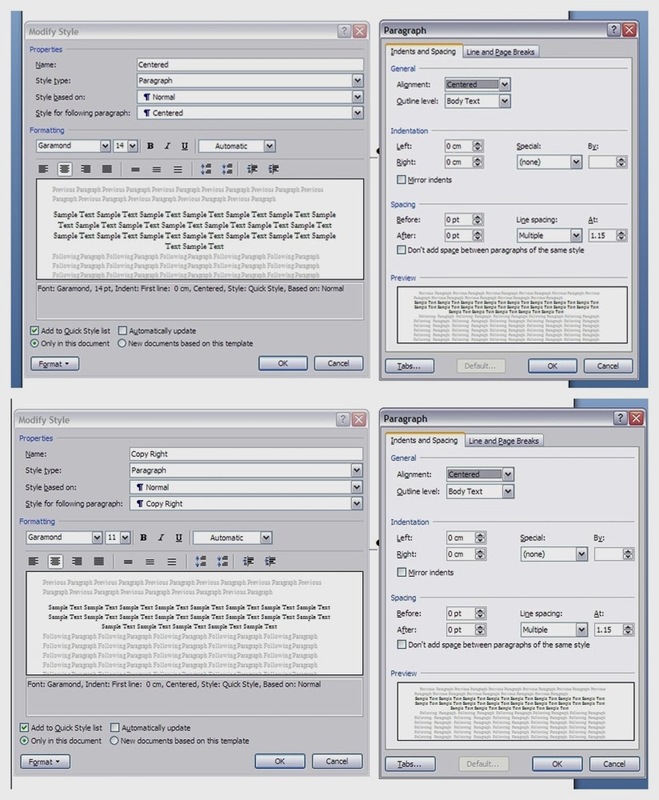 This section uses the Centered style but with the title font size increased for emphasis. This time you don't need a blank page you just go straight to your copyright page. Here you might want to change the layout again so head to the page setup popup menu and change page alignment to bottom and once again make sure its applied to this section. Now on your copyright page you will want to have the copyright and who ever created the cover art. It is also good to put a disclosure in if it is fiction. Now the copyright law may differ from country to country to make sure you know whether or not you are covered under the law of your country and included the rights listed in your copyright act. You may need to apply and pay a small fee for copyright protection. Then comes your ISBN, now some places where you can upload your book will supply you with an ISBN while others require you to have your own. There are several ways you can acquire an ISBN, you can purchase one or if your country permits it you can contact your National Library for free ones, if they provide that service. But if so you must adhere to their terms and conditions. And to close it is good to add something like this: All rights reserved. 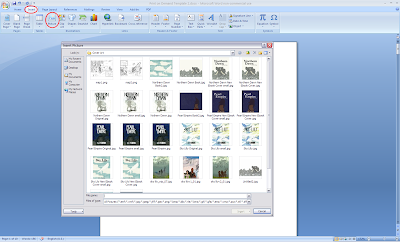 No part of this publication may be reproduced, stored in a retrieval system, or transmitted in any form or by any means, electronic, mechanical, photocopying, recording or otherwise, without the prior permission of the publishers, nor be otherwise circulated in any form of binding or cover other than that in which it is published. And of course end with a page and section break, this section uses the Copy Right style. Next up is your contents page now I always like to have a table of contents in my books because as a reader the titles of chapters often help me decided whether or not it sounds like a good book. 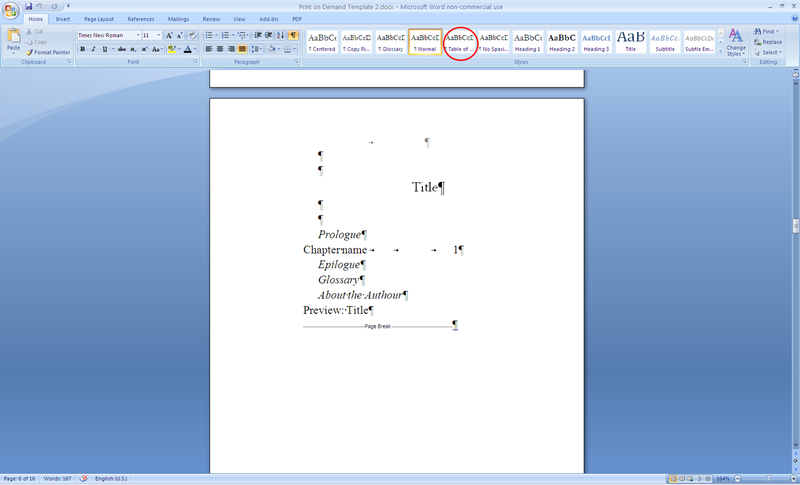 You can set out the table of contents in anyway which ever best suits your book. 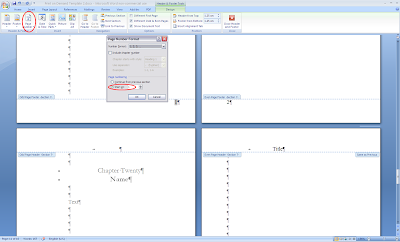 Note that here it is fine to use tab if you wish to list the chapter number and the name. And although you use the Table of Contents style you may also want to put certain sections in italics and give them a Special indent of 0.5 cm. 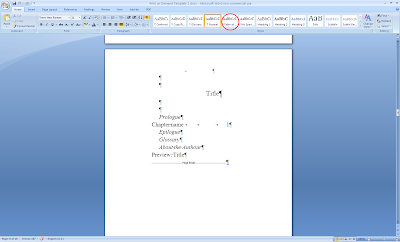 Now unlike with an eBook there is no fancy hyperlinks needed all you have to do is set it out and once the story is finished run through your document several times and jot down the page numbers of chapters and add them to your table of contents. 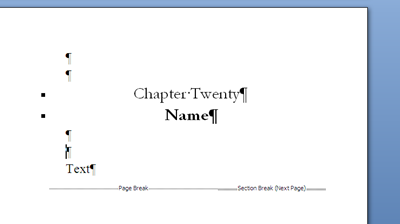 At the end page break and then another blank page with page and section break. You're almost ready to write now. 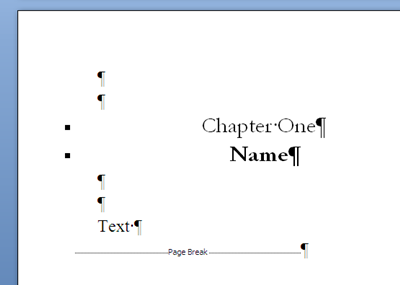 But if you have a prologue you will want to have a page and section break after it, you will see why in a moment. After each chapter however you simply only need to add a page break until the last chapter then add a page and section break. 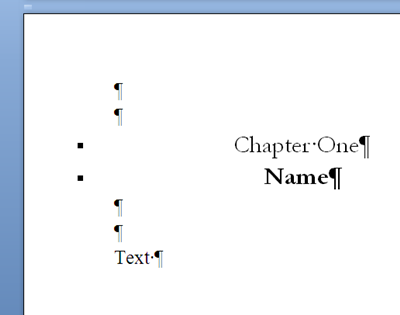 To keep it neat I add two line spaces before and after the chapter title. 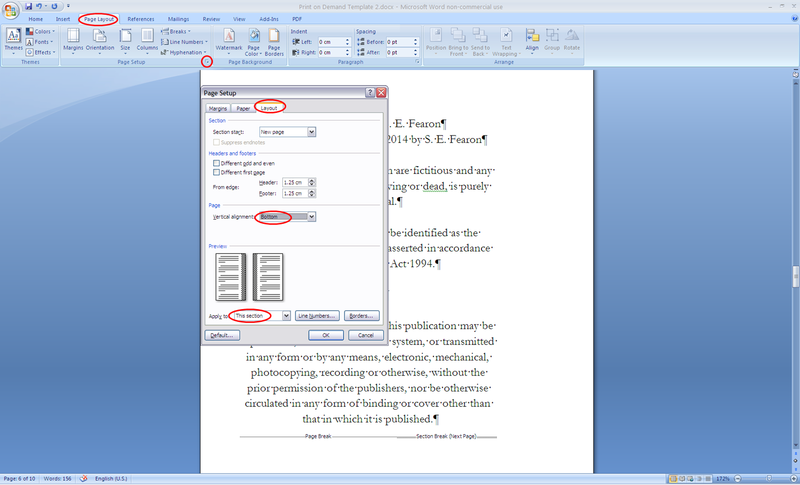 At the end of the document you may want to put a Glossary Page especially if you are using a lot of uncommon terms or foreign words. 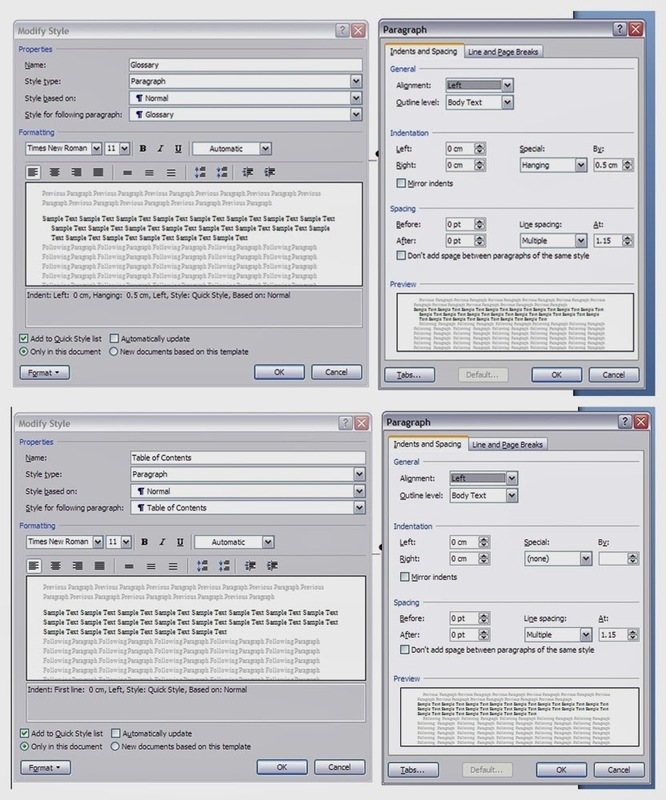 Here you will use the Glossary style and then for added emphasis make each entry bold. You may also want to add supplementary information such as a page about the author or a preview of your next book. But wait it’s not over yet, now that your document is in its entirety it’s time to sort out the pagination, which can be a bit of a nightmare. We will start with the easier one, find the beginning of your writing either the prologue or the first chapter and head to the insert tab and under header and footer click on header and select blank. Now it will take you to a new tab header and footer tools design. Here under the options section select different odd and even pages. 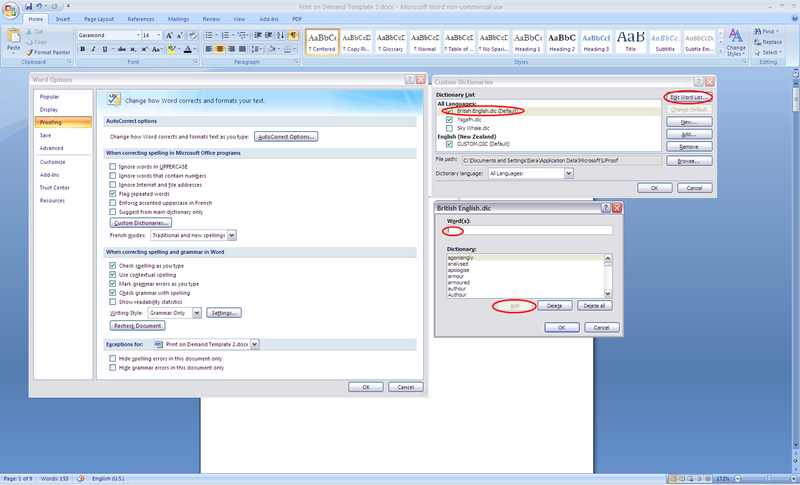 To make pagination easier it’s a good time to switch your view so that you can see two pages on screen at once. Now be sure to click on the right hand side and then under the position section click on insert alignment tab which will open a popup, you want to set the alignment to center. Now comes the tricky part you need to go through your document making sure that the header will only show between the prologue and the main text. 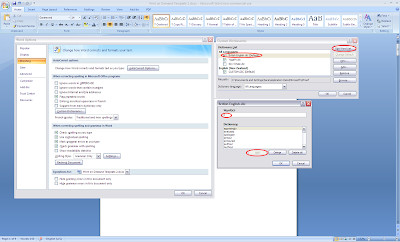 To do this click in where you have just entered the title and you will see under the navigation section that link to previous is highlighted, deselect this and then hit previous section, and continue to do the same up to your first title page. Then as you work your way back delete the title. When you are back to the prologue click in and then hit next section and keep going till you reach your glossary then you want to unclick link previous again and delete the title. 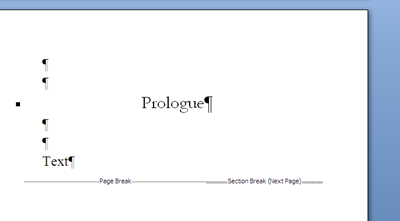 Note that if you have an epilogue include the header in it as you did the prologue. If done correctly you should only see the title header on the right hand side of your screen from the prologue till the end page of the main text. 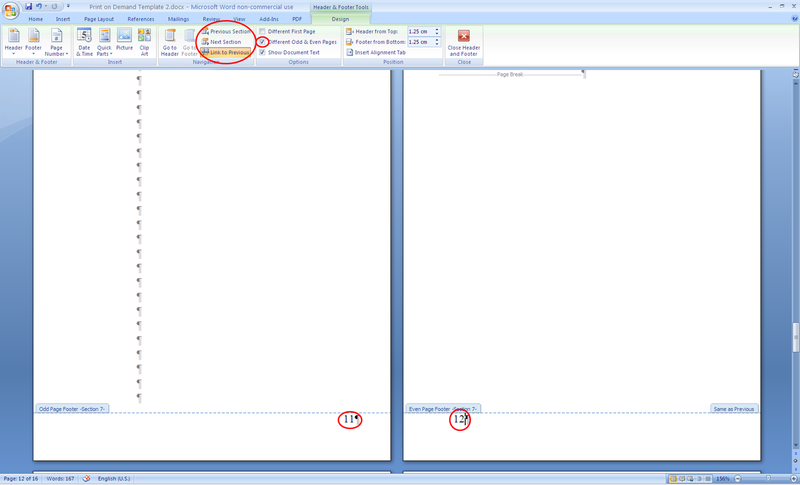 Now the page numbers can be a little trickier and can do weird and wonderful things to your document. Begin at the first page of chapter one and click on page number under the header and footer section of the insert tab. 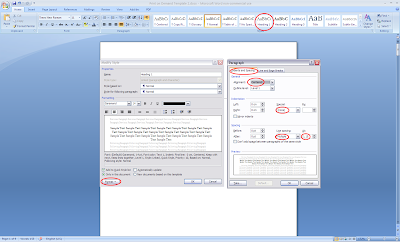 In the drop down select bottom of page and then Plain Number 3, you then want to do as you did for the header but this time keeping the page numbers within the main text only. Once done you want to start on the opposite page, the one on the right hand side and this time select Plain Number 1 and repeat the previous process of removing unwanted page numbers. Now you should have page numbers which are next door to one another. In theory you should now be able to change the page numbers, which is optional as some books count the pages from the first title, however I prefer a clean look as some other books and set the page number at one in the first chapter. 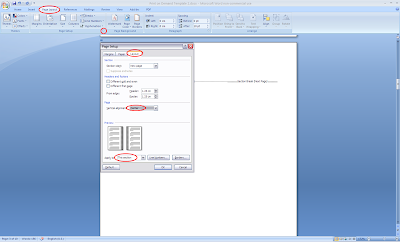 To set the page numbers to one you head to the header and footer section and click page number and then click on format page numbers and in the popup menu under page numbering set it to start at 1. 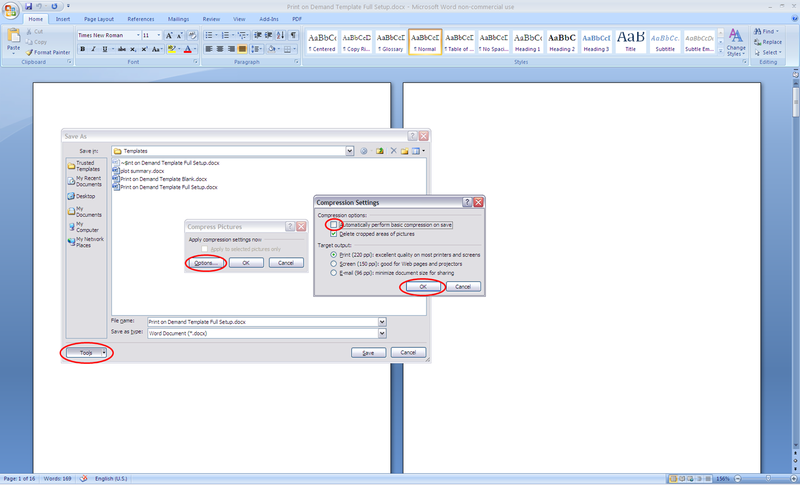 If all the steps previously are done correctly the pagination should now run smoothly. 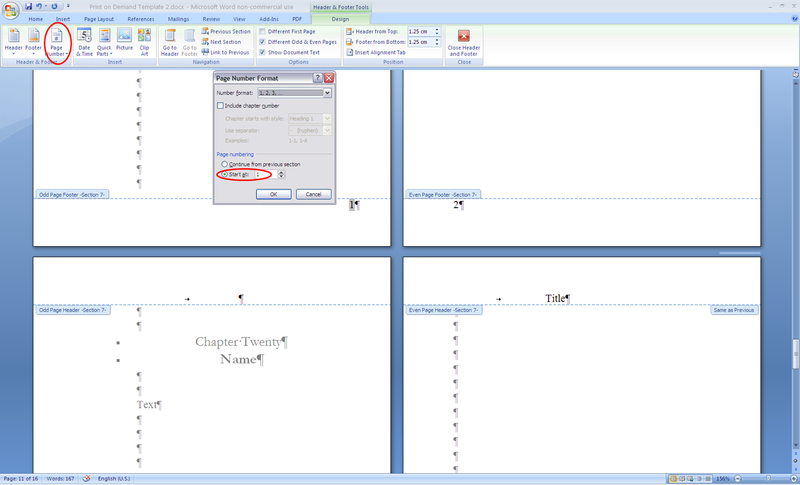 One thing to note is that sometimes your book might do something odd like suddenly change the gutter alignment half way through, so it is always a good idea to run through the whole document displaying to pages on the screen so you can notice it. If this has occurred you may need to add in an extra blank page, I’ve had this happen just before epilogues or between the prologue and the first chapter and it usually happens because it wants the new section to display on the right hand side when printed, which is the left hand side of your screen, so although you might think I will have a random blank page facing people it turns out okay in the end and when you view your work in the CreateSpace interior reviewer you will see clearly so don't panic. Last few things to do is go through with a fine tooth comb and check that it is all working correctly, do your final spell check, check all of your grammar and then save. When saving click save as and in the bottom left corner click on tools and in the drop down click compress pictures. 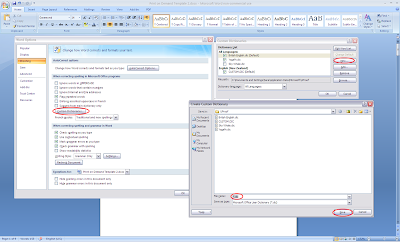 A popup will appear and you want to click the options button, another menu will open and you want to deselect automatically perform basic compression on save. This will stop Word from altering the DPI of your image, for optimal printing you need a DPI of at least 300. A thing to note however is that if you go back into your document again and again before upload it might reduce the image size again even if you did deselect automatically perform basic compression on save so a good thing to do is delete the image and insert again and save a fresh document file, labeled book 2. And so you are done! 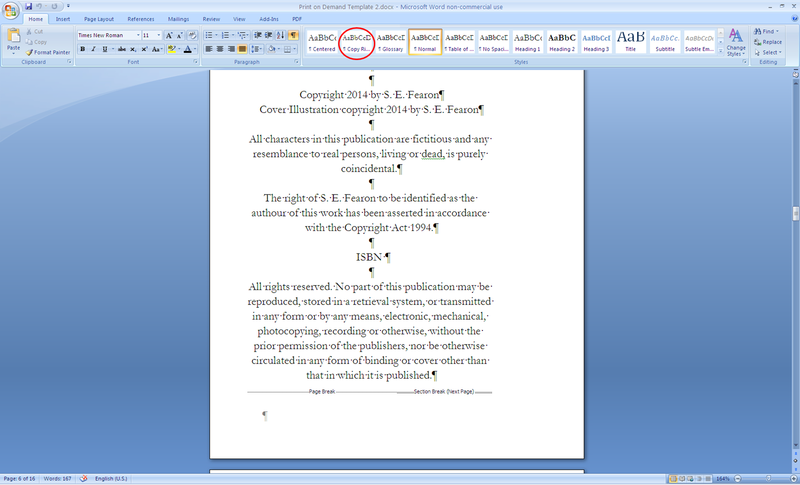 Now all you have to do is head over to CreateSpace to upload your files and you can learn about how to do that here.